Marketing personalisation and 1 to 1 communication strategies have been popular buzzwords in the digital marketing sphere and while very popularly mentioned is very rarely used and when used poorly executed by many sites. Marketing personalisation goes far beyond having a user profile and a Hi, username greeting upon login in, which most sites deem enough to claim they their site is personalised. It's about adapting the site and its offerings to individual user segments, behaviour and interests and giving users an optimised path to find exactly what they want faster than before. Research shows that consumers are hungry for more personalised marketing and as a millennial I am a real-life example. I'm happy to provide information to sites on my interests so they can tailor my search results better. This is evident on how relevant my Youtube and Google+ feeds are, with around 85% likelihood of showing me exactly what I'd find interesting or amusing. 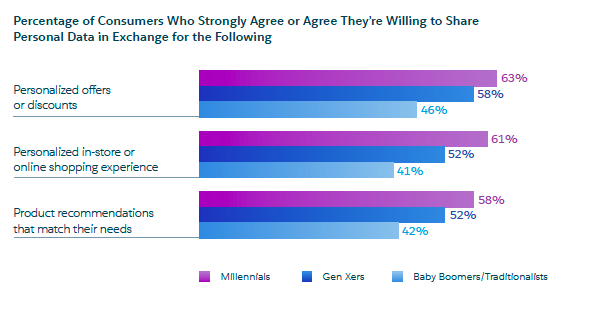 As a generation, 63% of Millennial consumers and 58% of GenX consumers are willing to share data with companies in exchange for personalised offers and discounts. This finding, from the recently published “State of the Connected Customer” report, shows that consumers are craving more customised marketing. For these Gen X (those ages 35–51) and Millennial consumers, personal data is a small price to pay in exchange for personalised in-store or online shopping experiences, or for product recommendations that match their needs. The goal of marketing has never been forcing a message down customers throats, but an experience, a referral, something as close to word of mouth as possible. When consumers feel like they're spoken to directly, they become attached the brand and eventually fall in love with the brand. Ever heard of Romancing the customer? The personalised marketing experience can remove the footwork that’s usually required on the customer’s part, it doesn’t feel like marketing. It feels like an easy interaction with a company that “gets” them. Seventy-two percent of consumers expect companies to understand their needs and expectations. Once you've gathered enough data you can start mapping out distinct user behaviour which you can then entice or encourage using your CRM strategy. Firing off personalised emails, app push notifications, personalised on-site prompts, optimised feeds and conversion funnels and so much more. In 2017, look to giving your users the gift of a more personalised experience and I guarantee you will have more satisfied customers more often.